Acting as your financial advocate, we help you realise your life goals, giving you peace of mind. We are totally committed to the concept of ‘client first’ and it affects everything we do, every day. Your dedicated Chartered financial planner works in the role of mentor, providing financial coaching as and when you require it. This approach provides comprehensive financial management with total personal commitment to support you and your everyday financial decisions. Our aim is to provide the highest levels of professionalism and financial competence, delivered with discretion, integrity and confidentiality. This has led to many long standing and close relationships with our clients. We like to keep complex things simple, so have a proven three stage process that we tailor to each and every new client. 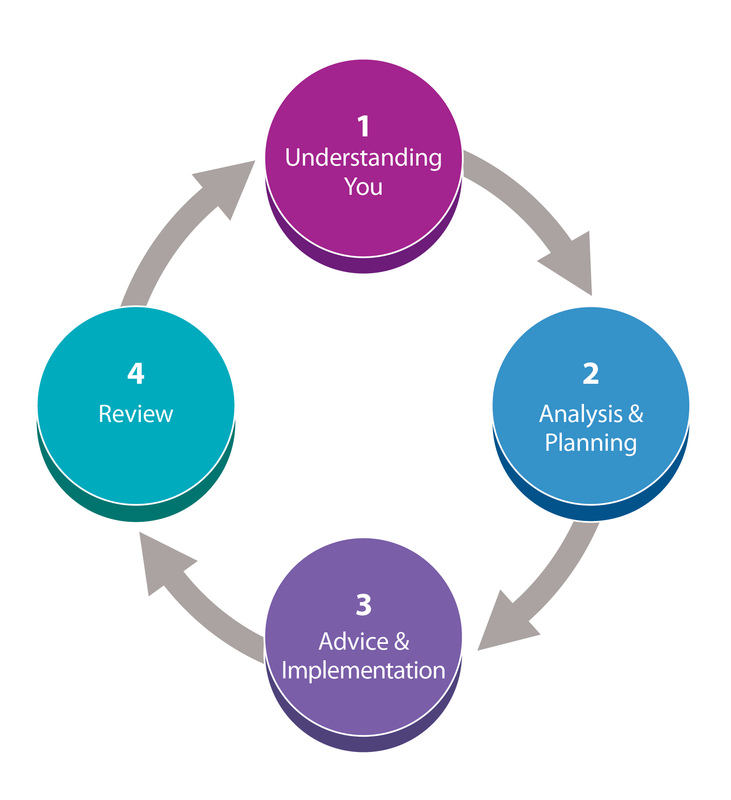 This is underpinned by a fourth step review to help ensure we keep you and your plans on track. We establish your goals, personal circumstances, aspirations and concerns. We collect all relevant personal and financial data. We establish your perceived risks. We collate all the relevant documents and information and fully assess your current financial information. We call this a Financial Audit. By exploring your attitude to risk and return, and your aspirations, this will help us to understand what you want to achieve. We assess your current position and how you have arrived there. We will explain the type of solutions that will suit your needs. We produce a detailed analysis and project the facts into the future, given various key assumptions. We’ll explore and research various scenarios and options that reveal how to utilise your existing provisions. We make recommendations as to how to build upon your current plans, to help maximise the chances of you achieving your objectives both present and future. We agree the most appropriate strategy and prepare your personal report and our recommendations. Should you need to put new plans in place, we will recommend the most effective implementation plans for you to help achieve your objectives over a given period of time. We will meet on an ongoing basis to assess your strategy and implement the next steps in your plan. We believe that all clients benefit from a review of their circumstances. We agree the style and frequency of meetings that suit you. This is often dictated by where you are in your life stage and your relative level of wealth. Most clients like to meet at least annually to ensure they do not miss out on valuable allowances, or are unnecessarily impacted by any of the UK Government Budget changes. You will hear from us between meetings when we feel something is relevant to you.